WTI crude prices sank below $47.50/b this morning. 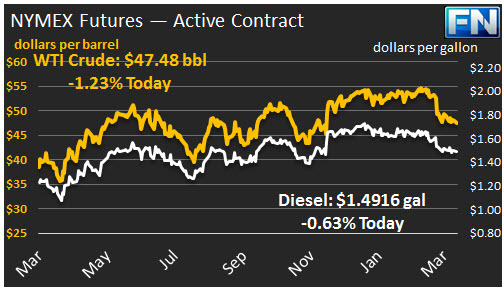 WTI opened at $48.12/b today, an increase of $0.44, or 0.94%, above Friday’s opening price, but prices ebbed to $47.48/b currently, a drop of $0.49 below Friday’s close. Diesel opened at $1.5028/gallon in today’s session. This was an increase of 1.45 cents, or 0.97%, from yesterday’s opening price. Current prices are $1.4916/gallon, down 0.60 cents from Friday’s close. Gasoline opened at $1.6109/gallon today, a jump of 2.31 cents, or 1.45%, from Friday’s opening. 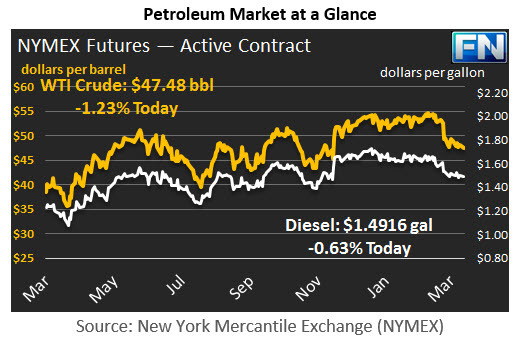 Prices are $1.5983/gallon currently, down 0.65 cents from Friday’s close. Markets are down following the failure of the Trump health-care bill in Congress on Friday. The Dow Jones Industrial Average dropped 77.73 points on Friday, falling to its lowest close in over five weeks. Investors are rethinking the post-election rally, since it is widely thought that the failure of the health-care bill will make it more difficult to undertake tax reform and tax cuts. Stock markets in Japan, Asia, and Europe also closed lower on Friday. The U.S. Dollar index fell Friday and opened lower again today. The U.S. Dollar Index has declined by nearly 3% during the current month. The OPEC monitoring committee met in Kuwait this weekend to analyze compliance and the effectiveness of the cuts so far. Kuwaiti Oil Minister Issam Almarzooq, the Compliance Committee Chairman, stated that OPEC compliance was 106% in February, whilst the non-OPEC participants, including Russia, had reached compliance of 64%. For the participating countries as a whole, compliance was 94%. The committee is likely to recommend an extension of the production cuts to the participants next month. The high level of OPEC compliance and the willingness of the group to extend the cuts is perhaps the key factor supporting oil prices at this point.